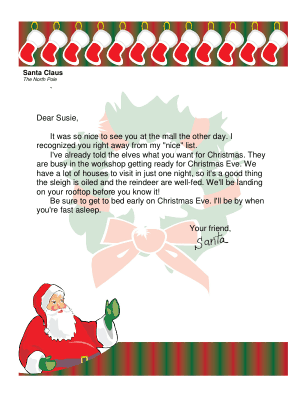 When a child has visited Santa at a mall, this letter will serve as an acknowledgement and keepsake from the big man in the red suit. It was so nice to see you at the mall the other day. I recognized you right away from my "nice" list. I've already told the elves what you want for Christmas. They are busy in the workshop getting ready for Christmas Eve. We have a lot of houses to visit in just one night, so it's a good thing the sleigh is oiled and the reindeer are well-fed. We'll be landing on your rooftop before you know it! Be sure to get to bed early on Christmas Eve. I'll be by when you're fast asleep.